Tonight we look into just a few of the plethora of unexplained disappearances in the Great Smokey Mountains National Park and discuss the phenomenon of strange vanishings at large. In this episode you’ll hear all the classic Midnight in Kentucky rigamarole; alternate dimensions, hairy hominids at work against the human race, and UFO and alien abductions. In addition, we hand out some useful advice from Mr. Missing 411 himself on how not to disappear on your next hiking excursion and take a look at why you should never invite the fae into your home. In the opening of this episode we discuss another mysterious boom heard in Central Kentucky (for those counting at home, that’s two in the last month) and the ‘transformer explosion’ in New York City recently, as well as eulogize the untimely end of the Topix forum. 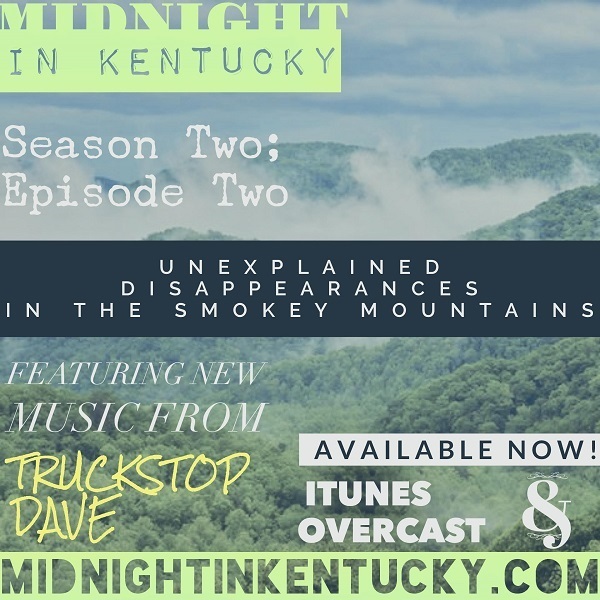 David Paulides may offer no theories, but Stephen and Ben sure as hell will in Midnight in Kentucky: Season Two; Episode Two: Unexplained Disappearances in the Smokey Mountains!